A brief new entry which we kind of missed before – as the coder Mario Knezovic had mentioned it in one of his previous creator speaks for Seven Gates of Jambala. At the same time as working on that C64 conversion for Thalion, Mario was also doing a conversion of the Alien Syndrome/Gauntlet clone called Leavin’ Termis (Or Leaving Termais). The game saw a release on the Amiga/ST back in 1990 and was a fairly well received game, though not the most popular overall. Mario had got a small way through the game’s development, but was never properly assigned a graphic artist to help finish the work – and the game was scrapped as a result after taking too long to find someone. Mario had up until then done test graphics himself to be later replaced. We know little more right now about the game, though the adverts never mentioned a C64 version it seems. It is hoped that Mario may have remains of the game, along with Lethal Xcess … we hope to try and find out very soon! Erik Simon: Well, since Thalion was in the wild days of the games biz, we never had to release really rotten eggs. But we did release games that in hindsight were not really cool, e.g. : Leavin’ Teramis, Seven Gates of Jambala, Enchanted Lands, Neuronics and a few others. Most of them concentrated too much on technology and had an unfocused game design. 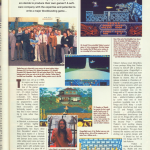 ACE Magazine Issue 29, Page 9, ‘Ace On The Autobahn’ Thalion article also mentions C64 versions of Leavin Teramis and Seven Gates Of…. A Thalion preview of the German short-lived computer game magazine SMASH stated in issue 3 – May/ June 1989 that the game probably will be released on C64 (tape+disk) along the 16 bit versions.